Better late than never, we’ve updated the gallery with over 300 new screen captures from Jane Got A Gun. Click through the preview to view them in the gallery. I was hoping to have some Jane Got a Gun screen captures for you guys this evening, but unfortunately that looks like it’s not going to work out. 🙁 Hopefully this huge batch of HQ additions to Natalie’s appearance at the Paris premiere of the film will make up for it. And here’s a new ration of Sunday tidbits for all you guys. – First some big news, Jennifer Jason Leigh looks to be joining the cast of Alex Garland’s Annihilation. After being beaten up by every man in The Hateful Eight, maybe she’s looking forward to this all female sci-fi film. – Here is another new clip from Jane Got A Gun and once again…it’s pretty good. – Speaking of Jane, here are a couple interesting video interviews with her co-stars. Joel Edgerton talks for over half an hour and gives good background info on the production. Strangely, he never mentions Natalie (or if he did I missed it). Then there’s a shorter video interview with Ewan Mcgregor from Jimmy Kimmel. We’re back with some more mini Natalie news items. Dig in! – Let’s kick off with the box office and despite being one of the more robust holds during the week, Jane Got A Gun fell off a cliff this weekend. Granted, with such a poor first weekend we’re talking a pretty short fall. Speaking off planting face first into the dirt, many moons ago Natalie was to star in Pride and Prejudice and Zombies. It was to be written and directed by David O’Russell, but he dropped out and went on to become the Oscar darling of the last few years. Natalie dropped out soon after and there was a string of directors coming on board and then exiting. The film was finally released this weekend and it’s another “why did they even bother?” with a massively underwhelming box office take. – Next up, a new German Knight of Cups clip has arrived with Natalie and Christian Bale having some fun on a pier. – Speaking of Knight of Cups, here are a couple very positive reviews for the film – Theology and Movies and Podcasting The Softly. Time to catch up with another round of Jane Got A Gun tidbits. Doesn’t seem like this film is going to be in the conversation for too long. Considering the long drawn out production and release, that’s definitely a shame. If you want to catch it in the cinema you better hurry up. Thanks to Belerofonte. – Let’s kick things off with a nice summary of the troubled production, as I’m sure there are a lot of you who aren’t aware of how it all went down. At one point it was set to be Natalie and Michael Fassbender starring in the next film from the incredibly talented, Lynne Ramsay. So here’s how it all went up in smoke. – The film pulled in $800k this weekend and the worst opening weekend screen average of Natalie’s career, although not that surprising given the lack of marketing available. – Forbes covers the wipe-out but offers a positive spin on things. And the sad irony is that, after all the fuss, it’s pretty good. It has some rough edges and it’s very slow (west), but it’s well acted, and its third act is awfully effective. If I may, Portman in full western gunfighter mode does cast an iconic image. I get why Weinstein didn’t spend much of a fuss on the film, as the financial Straight Up Films handled the marketing and the film has the whiff of damaged goods. But it’s not remotely a calamity and it’s a darn shame that this $25 million western drama is barely going to crack $750,000 for the weekend in 1,210 theaters. It earned $277k yesterday. I’m not saying you need to rush out and see it right now, but it’ll be one of those you stumble upon after theaters and feel a little bad for not giving it the theatrical support it could have used when you had the chance. 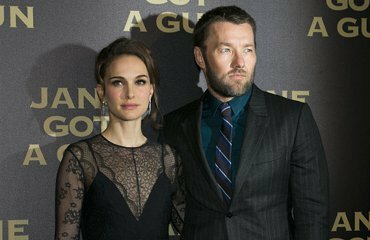 We have three new videos to share from the Jane Got a Gun New York premiere red carpet arrivals, including interviews with Natalie and Joel Edgerton (after the jump). Thanks to Belerofonte for the finds. The Jane Got a Gun promotion train is running at full speed now, and Natalie is attending the Weinstein Company’s New York premiere this evening. Hit the preview to view her arrival at the gallery; we’re adding them as we get them! Jane Got A Gun week continues and we’ve got lots of related updates. – The film is opening on 550 screens this weekend, which is one of those mid-sized releases that isn’t a small platform release where they hope to build and certainly isn’t a wide release. The Weinstein’s aren’t in a good place financially, which could account for not only that but why there has been little to no marketing push. Perhaps a fitting release for a film that has had one of the most troubled releases in years. Thanks to Belerofonte. – A couple reviews have landed with The Hollywood Reporter giving a mixed review. Portman certainly commits herself fully to the role, and one can imagine how much the double-duty of starring in and presiding over such a troubled project was no simple turkey shoot. Still, at times, the actress seems almost too graceful to be playing a woman in Jane’s predicament, especially one living under harsh conditions and suffering years of strife across the continent. The New Yorker is more mixed negative and touches on something that has bothered me in the trailers. Can a face as famously beautiful as Portman’s ever show the weathering of such peril, or the scars of a hardscrabble life? Well, yes. It certainly did in “Cold Mountain,” where she played a lonely widow in a secluded shack, and which she stole in a few brief scenes—shooting down a fleeing soldier, and weeping at the touch of a hand. Somehow, “Jane Got a Gun” fails to be scuffed by that sense of desperation. – This is a really nice video interview with Natalie and Joel Edgerton, in which they discuss working on Star Wars together, the troubles on set and Natalie ends by talking about the wage disparity between men and women. Natalie made an appearance on French TV last night to talk about Jane Got A Gun, Jackie and a whole lot of other things that I’m sure would be interesting if there wasn’t a French voice translating over hers. If memory serves, last time she was on this show she conversed at least partly in French, so I’m not sure why she chose not to this time. Check it out below and thanks to Belerofonte for the find. In her first big red carpet appearance of the year, Natalie attended the Jane Got a Gun Premiere at Cinema UGC Normandie today in Paris. We have a few HQ photos in the gallery right now and are adding more as we get them (thanks, Belerofonte!). You can head on over to Getty Images to view more in the meantime. I’m afraid that by the time any of us actually get to see Jane Got a Gun, we’ll have already seen most of it in clip form. Belerofonte found two new snippets from the film, including an exclusive from Just Jared that you’ll want to skip if you’re trying to avoid spoilers (after the jump).